Human embryonic hypothalamo-pituitary development is a complex process controlled by a spatio-temporal genetic cascade of transcription factors and signalling molecules within the hypothalamus and Rathke’s pouch, the primordium of the anterior pituitary (AP). The anterior and intermediate lobes of the pituitary derive from the oral ectoderm and the posterior lobe from the overlying neural ectoderm. The tightly regulated processes of cell proliferation and differentiation give rise to five different specialized AP cell types that secrete six hormones. Disordered embryogenesis can give rise to congenital hypopituitarism (CH), characterized by deficiencies in one or more of these six hormones in isolation or as combined pituitary hormone deficiency, with a wide variation in severity. 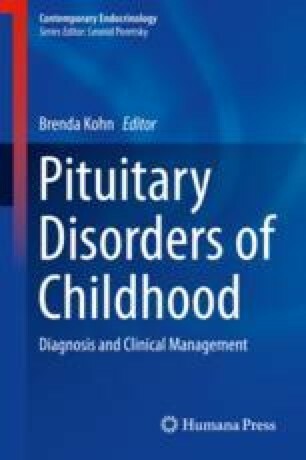 CH may present early in the neonatal period or later in childhood, with midline and craniofacial structural abnormalities often accompanying the phenotype, giving rise to a range of highly variable disorders that will be discussed in this chapter. Alsaleem M, Saadeh L, Misra A, Madani S. Neonatal isolated ACTH deficiency (IAD): a potentially life-threatening but treatable cause of neonatal cholestasis. BMJ Case Rep. 2016;2016. pii: bcr2016215032. https://doi.org/10.1136/bcr-2016-215032.